There are a few offerings taking place for this week’s Limited Time Magic events, and I’m ready to tell you about them. First, to continue with the tours that have been happening at Walt Disney World, there will be a new version taking place from October 14 – 18. This tour will include visits to all three castles at the Magic Kingdom, with an Imagineer sharing wonderful details about these beautiful locations. 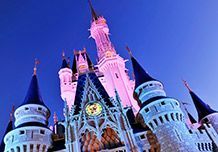 On this tour, guests will explore the Cinderella Castle Suite and see all the ornate details that have been painstakingly included to make this area feel as though Cinderella could pop in at any minute. From there, the tour will then make its way to New Fantasyland, where guests will discover more detail about Beast’s Castle. The tour will then take guests inside for a look at Be Our Guest Restaurant. One tour will take place each morning at 8:00 a.m., with 25 guests participating daily. If you are interested in attending, you need to sign up on the Disney Parks Blog by 2:59 p.m. Eastern Time today (October 11, 2013). Of course, details include that winners will not be able to bring guests, park admission will be provided as part of the event, participants can pick a date but are not guaranteed that date and if chosen will be assigned a tour date and time, a valid photo ID is required, and tours are subject to change. 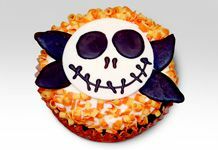 Another offering this week at the Magic Kingdom is a new Jack Skellington cupcake, which is in tribute of the 20th anniversary of the movie The Nightmare Before Christmas. Guests can pick up this spooktacular treat featuring the Pumpkin King’s face at Sleepy Hollow Refreshments in Liberty Square. 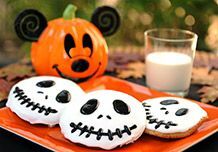 At Disneyland a special treat featuring Jack will also be available – this time in cookie form, with Jack’s face smiling at you. Guests can pick up this treat in New Orleans Square at Disneyland. In addition, Disney California Adventure will celebrate Oktoberfest at Bayside Brews for two weeks, from October 14 – 31. A special menu will be available, including delicacies like a bratwurst sausage served in a Boursin-garlic brioche with hickory-smoked bacon and sauerkraut, accompanied by potato chips or apple slices; a Bavarian Pretzel with your choice of mustard; and a gingerbread bundt cake. In addition, two beers celebrating the occasion will be served: a Karl Strauss Oktoberfest Beer and a Hofbrau Munchen Beer. Ok I wish Disney would let non US residents take part in the draw if you can prove you are out in Orlando at the right time. I’m out from the UK for 2 weeks so could do the tour. Oh, can’t I apply then? I’m in the UK too and leaving for wdw next Tuesday. That’s not fair.